I’m famous! Well, I’ve been featured in public, which must count for something, I think. Andy Warhol once said that ‘in the future everyone will be famous for 15 seconds.’ I wouldn’t dignify my time in the spotlight as being that long but hey, we can all dream, right? Some background is needed, to help fill in the gaps. A couple of years ago, a guy named Rhodri Marsden asked on Twitter for people to give him stories of family Christmases. Rhodri is an author, journalist and musician – a member of Scritti Politti, no less – and was compiling a book about what made for a traditional British Christmas. My elder daughter, Katy, shared a couple of stories with him and, following his acknowledgement, we heard no more. Until last May, that was, when Katy WhatsApped me to say that Rhodri had been in touch and wanted to chat about using one of her stories in his book, as it was a perfect fit. Fame at last! The book is a lovely mixture of funny and sad stories from contributors such as Katy, bound together by Rhodri’s witty writing. As you can probably guess from his subtitle, he based his themes loosely around the 12 Days of Christmas song. 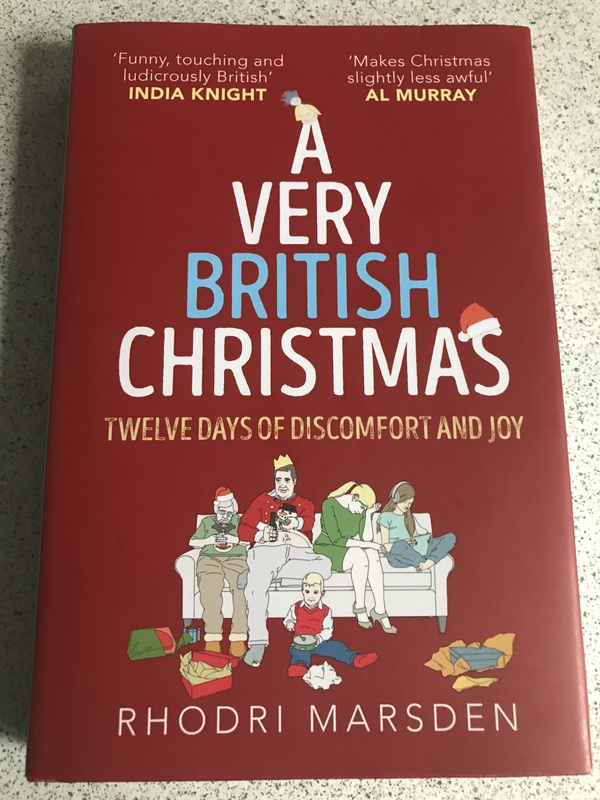 Very loosely, actually, with chapters entitled Eleven Sherries Swigging, Ten Carols Screeching and Five Broken Limbs! which is where I come in. I would like to point out that the excitement of winning a whole pound on a lottery scratchcard wasn’t entirely the cause of my sedentary gymnastics. I was ill at the time. It was Christmas, and I was always ill at Christmas, according to our family legend. But no one really wants to know that, do they? Apparently my roll from chair to floor in a semi-comatose state was quite spectacular to behold. And it is now recorded for posterity on the printed page. Am I a star, or what! We talked about the book for a while, and it brought back many happy memories of Christmases when the girls were little, not all of which were due to my various seasonal illnesses. Katy expressed a little disappointment that Rhodri hadn’t used her other story, though to be fair, now that I’ve read the book, I can’t see where it would have fitted in. I somehow doubt that he will be stretching the material he collected to a second book, and it is a pretty good story, so I’m going to share it with you, dear reader. As part of the table display, my wife had set out a large display bowl, filled with water and adorned with a decorative display of tea lights. As far as we could tell from the subsequent discussion, Ruth had been attempting to move a paper napkin to her Nan’s place opposite her own, and had somehow contrived to catch it on one of the candles. Not content with her nascent attempt at pyromania, she then managed to drop the aforementioned napkin onto the table, but missed the bowl of water and tealights. I don’t know if you’ve ever seen flames leaping a foot or so above your dining room table, but it is at once both spectacular and terrifying. What do you do to put out a fire? You use water, of course, don’t you? Being the nearest to a water source, I grabbed it and launched it at the fire, accompanied by four hysterical female voices screeching advice. The fire was successfully doused, but what I hadn’t heard in my leap into Fireman Sam mode was the warning from my wife that the saucepan of water I was about to use wasn’t exactly as I expected it to be. My brain went something along the lines of ‘fire-water-saucepan containing water- that’ll do.’ Unfortunately my eyes didn’t take in the full picture: the saucepan did indeed contain water but, also, quite a sizeable portion of leftover peas which had been intended for use in the Boxing Day bubble and squeak. Oops! I’ll admit to feeling very self-satisfied at the effectiveness of my fireman act, followed a millisecond later by a realisation that the water I’d used seemed to be very green! The ensuing panic then widened itself to checking that the table hadn’t suffered any lasting damage – it hadn’t – and to using copious amounts of kitchen towel to mop up all the water that Dad had just flung with wild abandon at the dining room table. Having done all that, we then embarked upon the Great Christmas Pea Hunt. Have you ever thrown a saucepan of peas and water at a table? The little green buggers can travel some remarkable distances, I can assure you! It took quite a while, and there was a careful balance to be struck between locating and rescuing the errant veg and not treading them into the carpet. Eventually we decided that we had rounded them all up, and could now enjoy our pudding, though the occasional outrider was still being spotted several days later. For some reason, my suggestion that we rinse all the peas off so that they could be used in the bubble and squeak didn’t meet with universal approval – in fact, it was the classic equivalent of the Eurovision song contest’s ‘Norvège nul points.’ Well, I thought it was helpful, anyway. I’m glad you enjoyed the stories – both completely true and needed no embellishment in the retelling. Yes, the peas did keep cropping up for a while, but we managed to round them up without treading too many into the carpet! The pea story is from the 1990s and the scratch card from the 2000s. Congratulations, Clive. Hope this Christmas you fared better. How did I miss this post. Very funny anicdotes or as my grandpa used to say after a couple of drinks antidotes about Christmas past. Thanks Michael, glad you enjoyed it. All true, too, and no antidotes in sight! I’m sorry, Clive, I didn’t see this when you published it, just now seen a retweet on Twitter. Congratulations 😄 And thank goodness the second story had a happy ending. No worries, Chris, there’s no compulsion to read my outpourings! It could have been a lot worse, we were lucky the table didn’t get damaged. It was black, so the scorch marks didn’t really show! 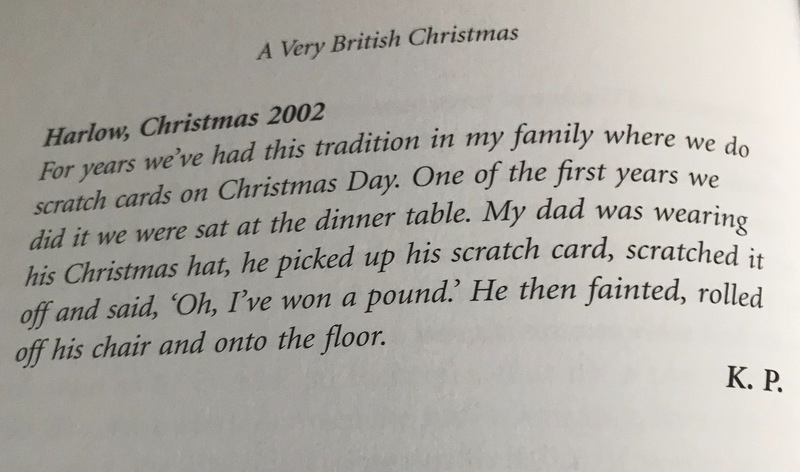 I had the absolute pleasure of spending one Christmas in Britain. It was memorable—the British know how to do it! It was somewhere in the mid-1970s,— I would have to go back to weather records for those years to find the exact date. Because it was a record-breaking weather event, with rain as thick as fog pouring down over the ten days we were there. But it didn’t dampen the Christmas spirit, which was jollied along by fireplaces, lots of candles, chocolate, and good cheer! Thanks for your story—funny and sweet! I don’t remember the weather being that bad – I guess we were used to it! I think we all have our own way of doing it. Back then, Christmas Day wasn’t complete without the whole family sitting round the tv to watch The Morecambe and Wise Christmas Show. This is mentioned in the book, as it was a fun way to round off a good day, and in those days we had only three channels to watch, so the audience was huge. Glad you enjoyed my version! I can attest to how far they travel because although we’ve never had a whole pan of peas to deal with, every time we have peas at least one person will let one/some escape from their plate or fork, and we will spend an inordinate amount of time scrambling around searching for them before they’re trodden on and spread around the house! Isn’t it funny how the disastrous events are always best remembered and almost become nostalgic. It sure is. For a few minutes we were doing anything but laugh! Congratulations Clive! We’re always ill at Christmas as well, and this year was no exception. Grr…. It seems to be part of a traditional family Christmas, doesn’t it! Yes it does. I caught a bug from my hairdresser just before Christmas, but it seems everyone’s going down with it. Not too bad thanks Clive, but everyone at work is sneezing and coughing. It’s like working in a doctor’s surgery. Loved this one Clive; I like your sense of humour. Now, can I bore you with my own Christmas story which, as it happens, had a sequel this very day. One of the many NGOs based in Ireland is called GOAL and every Christmas they invite people to walk a mile and make a donation. One of these GOAL mile’s takes place in a wood a short distance from my home. I did the walk on the previous two Christmas mornings and this year Mrs P agreed to accompany me. My mobile phone was out of charge so we left it behind. I got in the car and waited whilst she donned her bots in the porch having previously set the alarm. Now it’s important to note that our alarm is a monitored one – there’s a bunch of people in an office somewhere in Dublin 24-7 to respond to any alarm call. The alarm company, having failed to connect with my mobile had rung him. A quick turn around and we are heading back down the hill towards home. I can see the blue lights flashing on the approach road to our development. When we arrive we are very impressed with the rapid response, explain the situation and apologise for getting them out on Christmas morning (a lot of them in the village are part-time volunteers). This morning we got the bill in the post. Ouch!